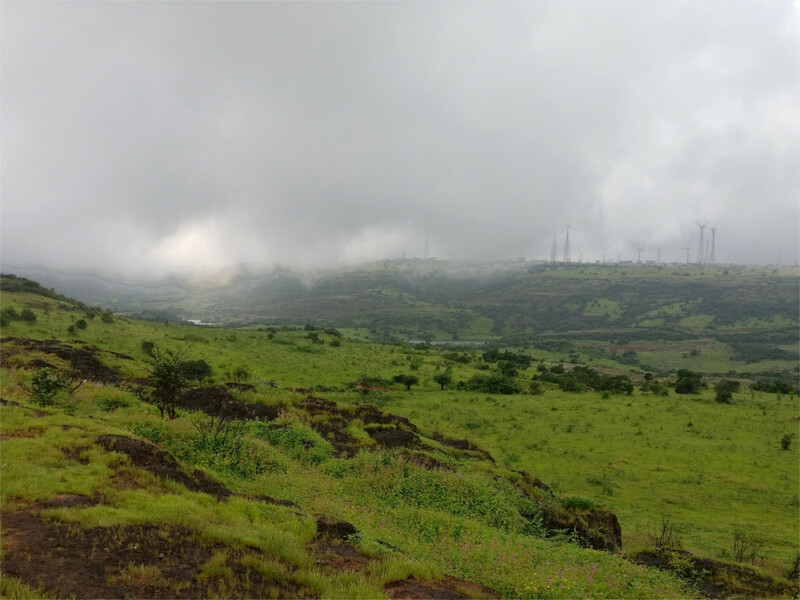 Kaas plateau is a seven hour drive from Mumbai. The herbs flower in the closing weeks of the monsoon: between September and early October. Many of the flowers you see here are also found in the nearby Mahabaleshwar plateau and in Lonavala, closer to Mumbai. Expect lots of small herbs, few bushes and trees only rarely. Be prepared for long walks in rain and mud, with no food and water except what you carry with you. 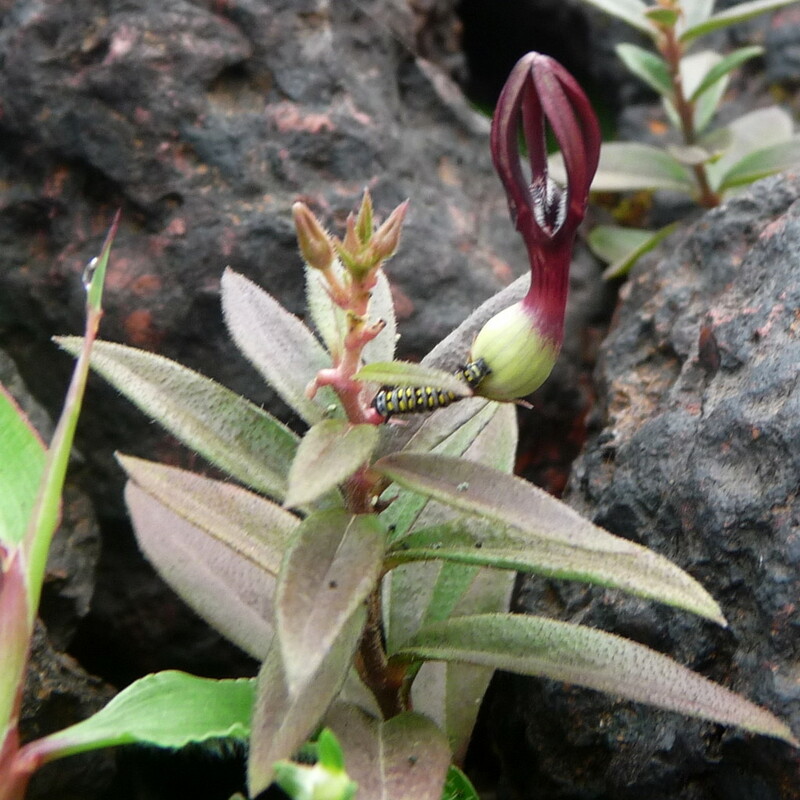 Flowers and herbs of the Western Ghats, especially of the Sahyadris, are now well documented. There are many guides for amateur naturalists like me. I was introduced to the pleasures of flowers by Adesh Shivkar and Mandar Khadilkar; google them if you wish. There is nothing available yet for an amateur explorer of the fascinating tiny world of mosses and lichens (see the featured photo). The bladderwort (called Utricularia by botanists) is the biggest family of carnivorous plants. In the Kaas plateau we saw large fields of purple bladderwort. The plant is aquatic: it floats on the thin film of water trapped above the stone of the plateau. The long stalks of the plants grow leaves at intervals. The bladders, which give the family its name, grow along the leaves and usually stay below the surface of water. Bladderworts are widely known to be carnivorous plants. Their bladders trap tiny invertebrates. I later found that this two hundred year old picture of carnivory may be wrong. 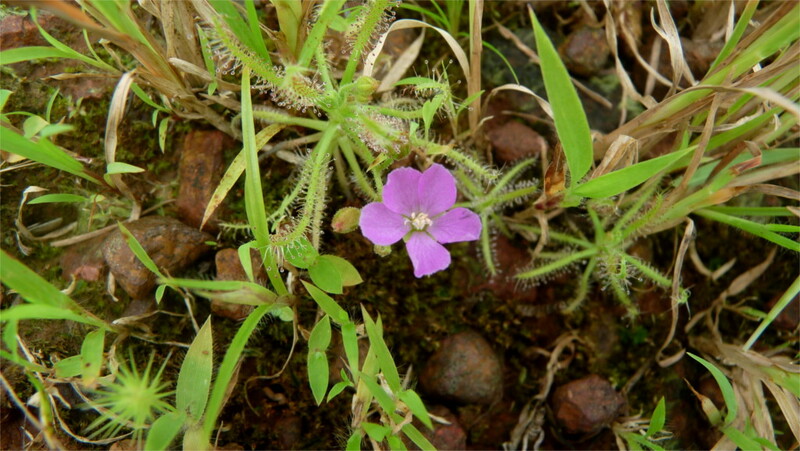 Plants turn to carnivory when the soil is poor in nutrients. However, they do not give up photosynthesis; their leaves are still green with chlorophyll. Carnivory gives the plant nutrients like phosphorus and nitrogen which are in short supply in the soil. The first blow to the idea of purple bladderwort being carnivorous came from careful measurements of the animals found in the bladders. These showed that at most 1% of the nitrogen and phosphorus that the plants need can come from the animals. Yet more amazing is that each of the bladders seemed to contain a whole live ecosystem of the small invertebrates which were trapped. New bladders did not have them, and older bladders had more animals. So it seems that the purple bladderwort is not a carnivore. It must gain something else by sustaining this ecosystem inside itself. Unfortunately no one knows yet what the plant gains from this. But it seems that the purple bladderwort (named for the purple flowers you see in these photos) may not be a carnivore. The carnivorous sundew which you see in the featured photo is properly called the Drosera burmanii or Burman’s sundew. It is mistakenly called Burmese sundew sometimes. The story behind the name took me back to the origins of modern biology. It was described in detail in a book by the Dutch physician Johannes Burman, who spent a few years in Sri Lanka. His assistant in the production of this book, called Thesaurus Zeylanicus, was Carl Linnaeus. This was 1735, and Linnaeus had just published his own book, the Systema Naturae, which was to change the world by inventing a new way of naming all living creatures. Linnaeus’ naming system is the one all biologists and amateur naturalists follow. Darwin, in his book Insectivoruous Plants, remarked on the common trapping mechanism through the sticky “dew” which you can see in the photo, and classified all sundews into one family, which is still called the Droceraceae. Darwin was a wonderful naturalist and asked most of the questions which keep drocerologists busy till today. 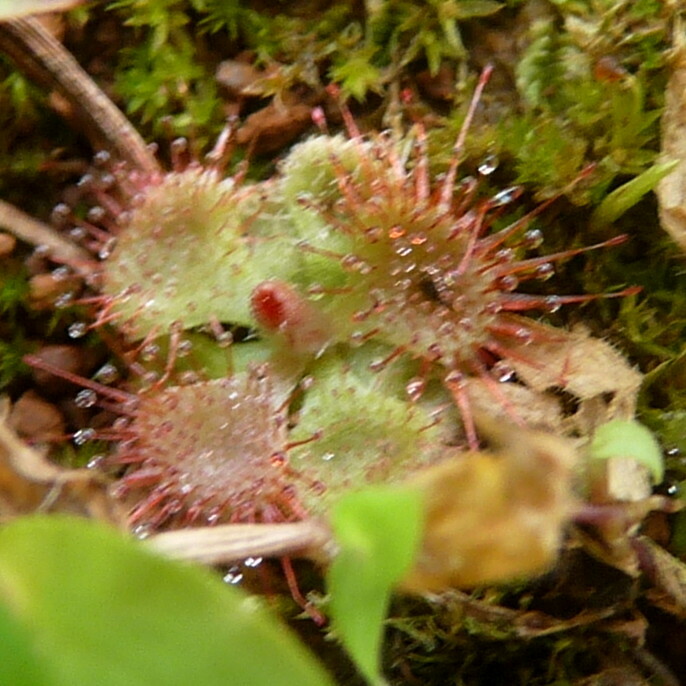 Are the sundews selective about their prey? In the nearly three centuries that have passed since the first descriptions of sundews, all evidence indicates that they are generalized carnivores. They feed on whatever gets stuck in their dewy glue. How large can their prey be? Darwin believed that they feed on fairly small animals. Strangely, there have been no measurements of their prey since 1925; and that was the first one since Darwin himself. So, if you happen to take photos of any sundew with its prey, you will add substantially to the sum total of human knowledge. I scanned about 20 plants quickly, and if they had captured prey, then they were too small for me to see with my unaided eye (the photo here shows a small insect stuck to the plant). Are all carnivorous plants related? Fossils and genetic data seem to say that carnivorous plants evolved six times independently from completely different origins; so the bladderworts and sundews that I saw were not related. A question that Darwin never asked is why a plant would turn from photosynthesis to carnivory. The general observation that these plants grow in nutrient-poor soil was taken as enough of an answer. However, there are other entirely photosynthetic plants which grow all around the sundew, so this is not a complete answer. Studies show that carnivorous plants grow and spread better once they get enough prey. Notice the bits of green on the leaves of the D. burmanii? These contain the usual chlorophyll that allow plants to use sunlight to make sugar. The density of spiny hairs is much smaller on this portion than in the red part of the leaves. So they also do photosynthesis, but they are less efficient at it. The complete story of carnivory versus photosynthesis is not yet known. In the same patch of ground where I took the other photos, I also saw several flowering specimens of Drosera indica (one example in the photo above). This was first named by Linnaeus in 1753 based on a drawing of a plant collected in Sri Lanka. A field study in 2013 by Allen Lawrie found that there are actually 11 different species which were conflated into the single species D. indica. Are there several unrecognized species hiding behind this one label in India? I do not know the answer. While we talk about names, you will notice that I have called these plants carnivorous instead of following Darwin and calling them insectivorous. This is because detailed counts of prey species indicate that sundews feed on anything the right size, without specializing in insects. 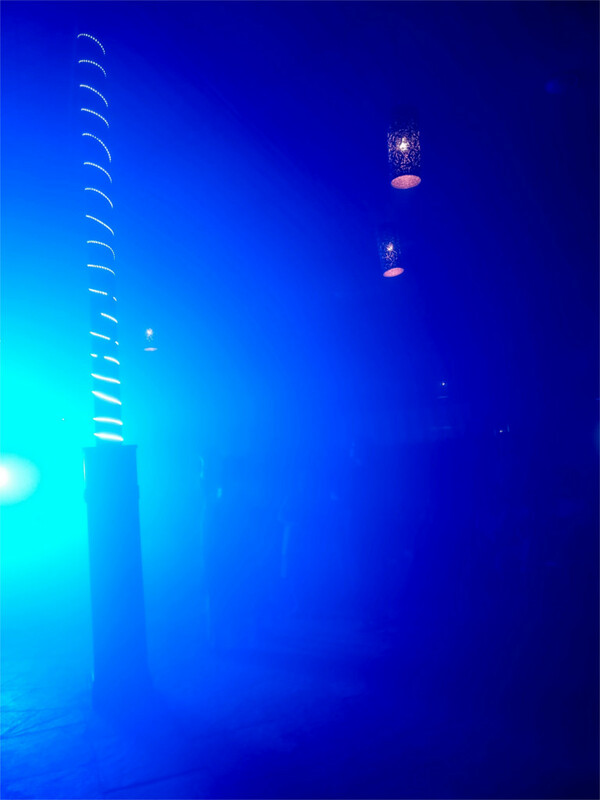 I’ll not say much more about D. indica because I’ve already written about it in another post. Are D. burmanii and D. indica in competition when they grow in the same patch of ground? Studies of prey captured by other carnivorous plants which grow together show that they capture the same species, and so may be considered as competing. I know of no studies of prey species among the sundews of the Sahyadris, but there is no reason to believe that they are exceptions. In that case the spreading stalks of the indica with their larger numbers of leaves possibly give it a photosynthetic edge. Maybe that is why they are more common. I wish I knew a professional ecologist who could answer these questions. The genus of plants called Ceropegia are pollinated in a very strange way, The Family explained to me. After her first trip to Kaas plateau two years ago, she showed me photos of this strange flower and explained how they trap flies to pollinate themselves. The upright flower opens up and flies come in to look for nectar. As soon as they land, the petals close into the cage shape you see in the featured photo. The frantic fly buzzes about and pollinates the flower. After this the flower droops down and opens up to let the insect out. In the bunch of Ceropegia vincaefolia that you see in the featured photo, two of the flowers are ready, and the droopy one has been pollinated already. These tall bushes were fairly common around the Kaas lake. Apart from the mode of pollination, I found the green colour of the petals rather unusual. But the most marvelous sight of the trip was this tiny plant on the plateau: Ceropegia jainii. I was lucky to be with two naturalists who knew roughly where to look. This species is a little rarer than tigers. In the photo you see the green egg-shaped base called the crown kettle, and the purple crown tube formed by the five petals. If you look closely, you will see the downward pointing hairs inside the tube which trap the fly. If this flower is similar to that of the C. vincaefolia, then at the narrow bottom of the crown kettle is the hard-to-reach corolla. I was not going to dissect such a rare flower to look inside it. The whole flower is a little less than two centimeters long. You can see that it grows on an unbranched stalk with thick leaves. In the photo above you can see other buds forming on the stalk. I was so thrilled with the sight that I noticed the caterpillar only after looking at the photo. It will eventually grow into the spectacularly coloured butterfly called the plain tiger (Danaus chrysippus). I don’t know whether there is an association between this and C. jainii. Since host plants of the plain tiger include other known milkweeds (family Asclepiadoideae) it is not impossible. On the other hand, I did not see the typical circular holes that the caterpillar makes in the leaves of its host plant. In any case, this is something to watch for in future. Sonkadi (Pentanema indicum) is a short spreading herb which you see almost everywhere in India when it is not too dry. 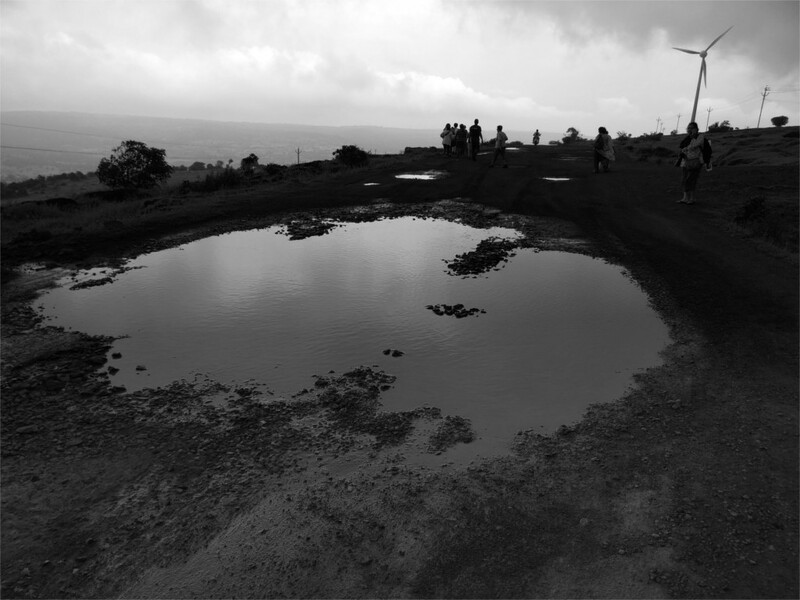 In the monsoon it grows all over the Sahyadris. 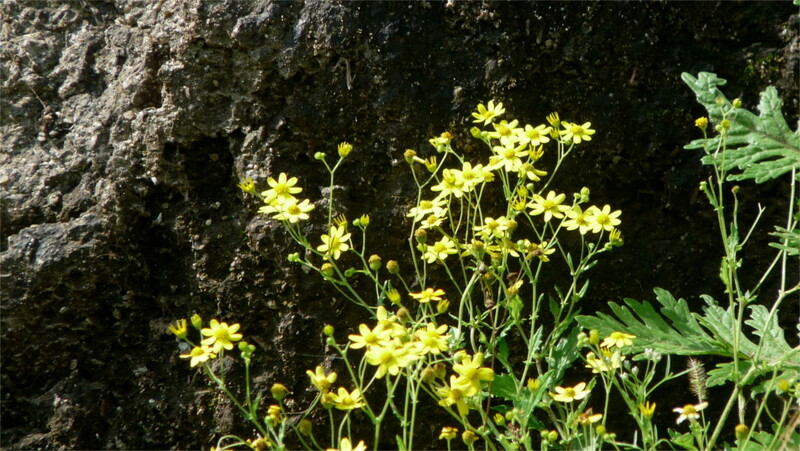 Clusters of these yellow flowers can be found in roadside ditches, wastelands, as weeds in untended gardens. It is often used in folk-medicine, to cure everything from colds and fevers to stomach pains. In fact so many useful chemicals have been extracted from it that there are studies on how to grow the flowers in the lab without having to grow the whole plant. Why is it so hardy and widespread? Where did it come from? After a lot of search I found that these simple questions are too complicated to answer now. It turns out that this species is a member of the largest family of flowering plants known. This is the sunflower family, called Asteraceae. Within this family is a tribe called the Inuleae whose core members have yellow hermaphroditic flowers. This is where the Sonkadi belongs. This is a partial answer to the questions that arise in my mind whenever I see these hardy plants poking out of inhospitable spots. 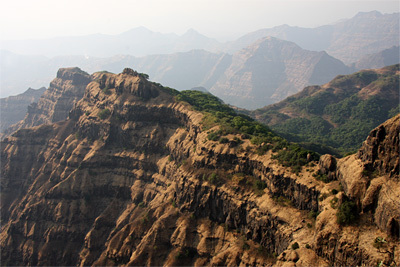 The region of the Western ghats around Satara and Pune are full of large plateaus and oddly shaped peaks. When you travel through them, the first impression you have of the mountains is that they look like a layered cake. I stood at the Thosegarh waterfall (featured photo) and found that even the monsoon-fed vegetation could not hide this appearance. The layers are a succession of lava flows, laid down in a massive burst of volcanism 60 to 100 million years ago. These successive layers of lava are called the Deccan traps. I found it hard to estimate the thickness of the layers by eye, but going by the heights of trees, perhaps they are between 50 and 100 feet thick. Since each layer of lava covers a considerable area, this means that each burst of volcanism would have lasted long and spewed out immense amounts of rock and ash. Not only would this have killed all life where it flowed, it would have dimmed the sunlight reaching the earth, and contributed to a mass dying of vegetation around the world. In the 60 million years since it contributed to killing off dinosaurs, the traps have weathered. Today we see them as flat topped hills, cut through by deeply eroded valleys. Some of the waterfalls lead down to rapids extremely suitable for white water rafting. In other places there are very wide valleys. 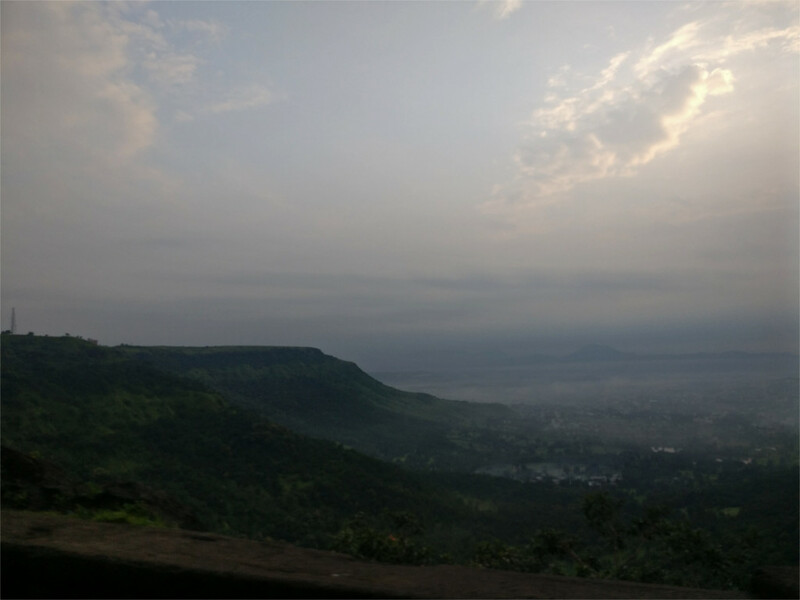 The town of Satara, which you see in the photo above, lies in the extreme western end of the rain-shadowed region of the Deccan. 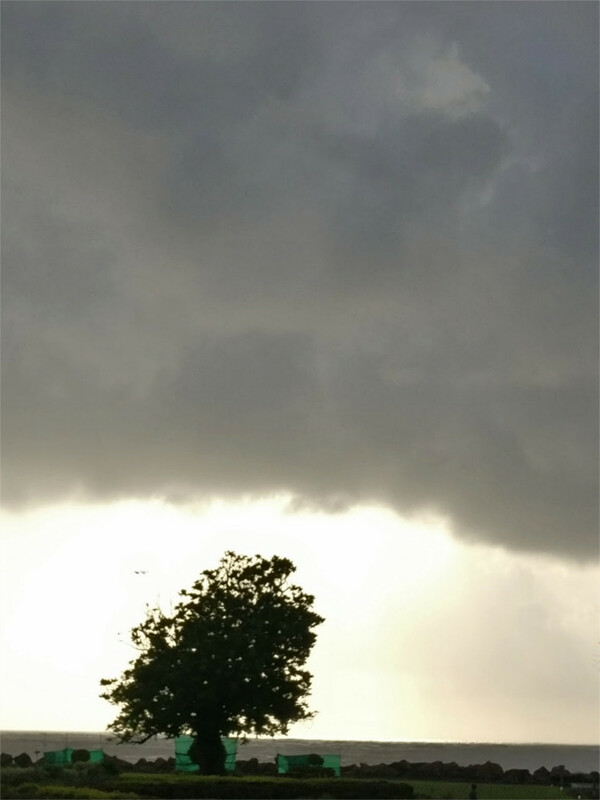 As a result it gets sporadic monsoon rains, enough to keep it green. The urban sprawl gets its drinking water from the river Umboli, which arises in the Kaas plateau, about 25 kilometers away. Traveling in this area, I saw many high plateaus. At one point each of them must have been home to the variety of flowering herbs and bushes whose diversity is now mainly visible in Kaas. When you reach the top of one of these plateaus you see exposed rock everywhere. This is the volcanic rock called laterite, formed by weathering of the traps. 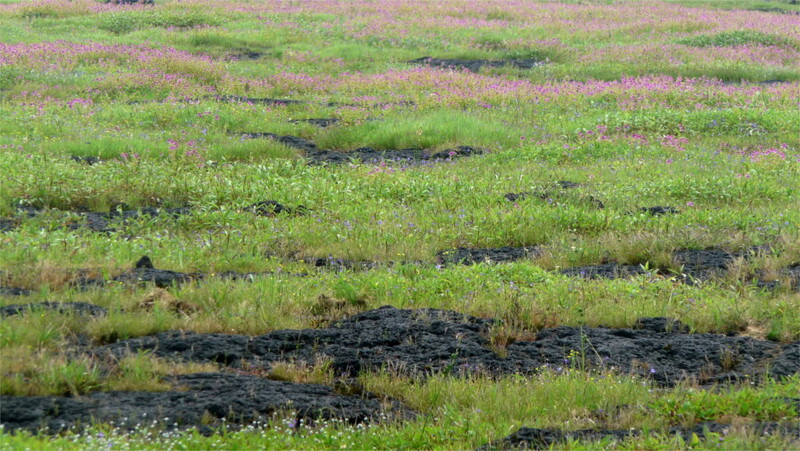 You can see the dark porous rock peeping out from the low cover in the photo of the Kaas plateau above. There is hardly any soil. What little there is forms in little depressions in the rock. This area is covered by tiny herbs: mainly the carnivorous bladderwort (Utricularia) and sundew (Drosera) species, and tiny coexisting herbs. Between such rocky outcrops, there are deeper fissures where a little more soil can collect. There are higher bushes such as the Topli Karvi and arrowroot. There are very few trees on the plateau. 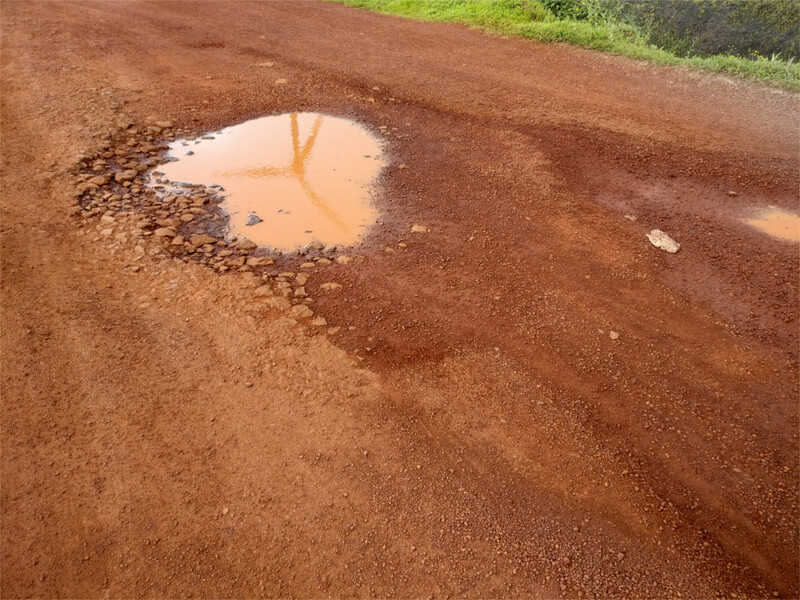 What little soil forms is constantly removed by rain and wind. It is a marginal environment where extremely specialized plants grow. Twenty meters below the top, soil can accumulate, and the vegetation changes quite dramatically. It becomes characteristic of the rest of the Sahyadris. As a result, these high plateaus are like islands: the flora of each plateau is isolated from those of its neighbours. 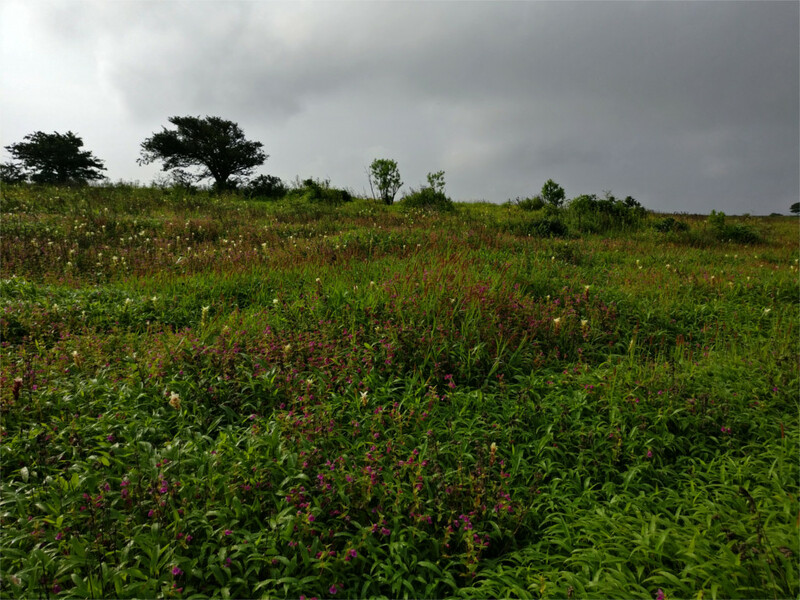 When you walk through the Kaas plateau your eyes take in the evidence that geology determines ecology, that life is shaped by the land. 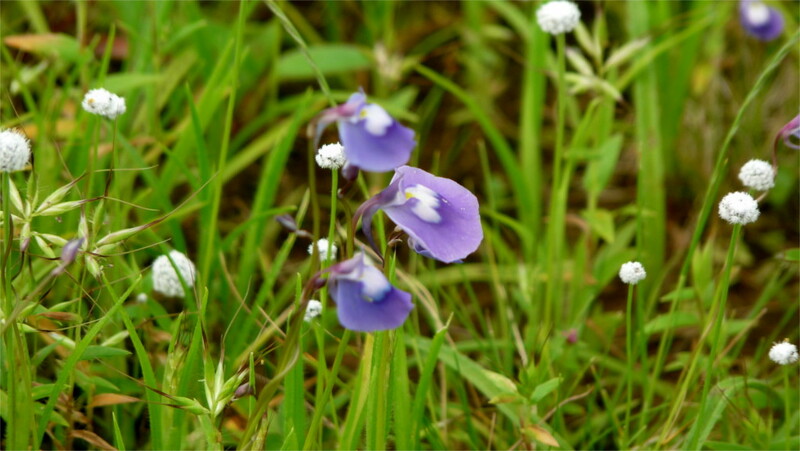 I’ve written about the world heritage Kaas plateau before. I went back there over the weekend. The volcanic rock barely holds any soil, and what little is there has little nutrient. The plants that one can see here have evolved in this hard environment. As a result, this 10 square kilometer area at an altitude of about 1.2 kilometers is an island mountain: the flora here is isolated from flora in other plateaus in the region. There’s a brief but glorious flowering at the end of the monsoon. By all accounts the flowers change almost every week. The most famous plant here is the Topli Karvi (Strobilanthes sessilis) which blooms in mass once every seven years. Last year this was in bloom. This year the general view (see photo above) did not show any of the bright blue flowers of this bush. One had to search hard for the few isolated and idiosyncratic bushes of S. sessilis which flowered this year. Instead the landscape was full of patches of white globular pipewort (Eriocaulon sedgewickii) mixed in with the vivid colours of the carnivorous purple bladderwort (Utricularia purpurascens). In other places we patches of the yellow sonkadi (Pentanema indicum) mixed in with the violet rosemary balsam (Impatients oppositifolia). You can see all four species in the featured photo. This week the balsam outnumbered everything. Most green patches had highlights of violet. Maybe by next week the sonkadi will dominate. I find that there is something touching about people who turn to art late in their life. On a weekend’s trip to the Western Ghats, just outside Mumbai, we were in an open dining space crowded with wooden sculptures. I made a joke about the wooden poses that the sculpted figures were in. The Family found them quite interesting. So I looked at the horse and the seated warrior carefully. True enough, the proportions were wrong, and bodies had too few joints. But it was interesting where the artist had put his attention. The face has minimally delineated, but the turban was carefully shaped. The head of the horse had received less attention than its shoulders. In fact, the body of the horse looked unreal, but had clearly been shaped with attention. I met the artist later (photo on the right). Communication was difficult because we spoke each others’ languages badly. He had been a carpenter all his life, but had recently started making these pieces. The shapes are dictated by the pieces of wood that he finds. He described what kinds of odd pieces of wood had gone into the sculpture of the horse and armed rider. 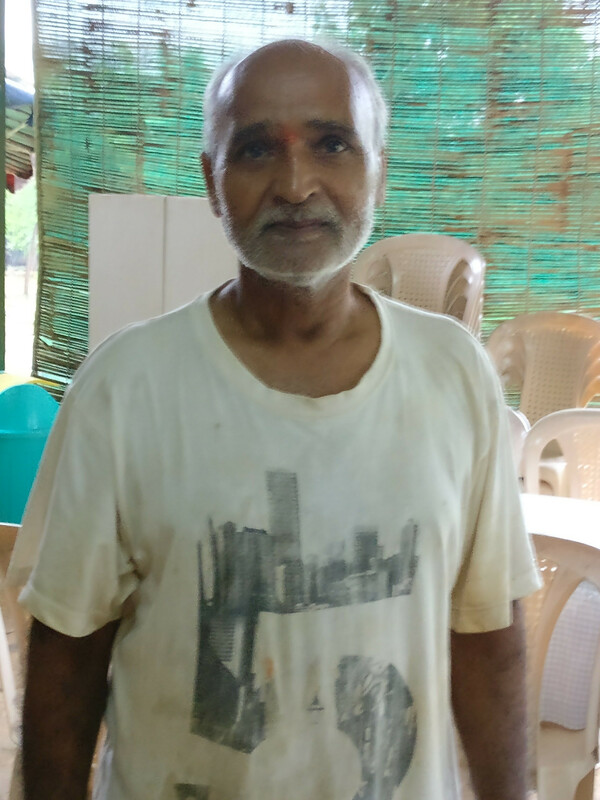 He doesn’t always recover the money that he puts into buying the wood, but he economizes because some of the wood is not usable in other ways. I could not ask him about his motivations, and why he felt he needed to express himself in this new way. These are questions which plague a blogger, and it would have been nice to get answers from someone similar.